1) For some reason, I come across a creator's work. Maybe it's on the recommendation of somebody else, maybe it's because they teamed up with another creator I'm already familiar with, maybe it's blind luck. In any event, I get my hands on some of the creator's work. 2) If I like said creator, I'll start seeking out what else they've done. This often involves a bit of research, usually online. I usually start by just trying to track down a record of what they've worked on, and start hunting the back issue bins. In the case of web comics, I spend an inordinate of time going through their archives. 3) If I like the additional material, and start to get a sense of the creator's artistic skills and sensibilities, I'll start trying to track down more information about the creator him/herself. Generally, this is just straight bio-type stuff. But my thinking is that the more I understand them, the more appreciative I am of their work. (This is something I hold to on the whole, in fact. I started listening to classical music to better appreciate it's use -- and, often, bastardization -- in Warner Brothers' cartoons.) Contrarily, if I didn't like/appreciate a piece in the first place, it's unlikely (which I know from previous experience) that I'll gain a better appreciation of it if I spend the additional time trying to understand the creator(s) behind it. 4) As I learn more about the creator, I start making connections with them. "Oh, I had the exact same experience -- that's why such-n-such comic resonnated with me so well!" I start to feel a kinship of sorts. It's stronger, obviously, with those whose backgrounds and histories I more closely identify with, but there's often at least some connection that I can latch on to. 5) Now, here's things get interesting/frustrating for me. Because of this connection, I start feeling like the creator is someone I could be friends with. Maybe they remind me of someone I knew/know, maybe they just sound like a great person to hang out with, whatever. In some cases, that's clearly just not feasible. If the creator lives a far distance away and doesn't spend much time online, for example. Not a big deal. But some creators are online quite a bit. (I haven't found many that live even remotely close to me, so that's generally not even an option.) The thing is, though, that they already have established relationships with a number of people online, and have a group of some sort that they already hang out with. If it's not readily apparent on message boards, it's often quite obvious with photos they might post online. If the pictures don't tell the story clearly enough, it's evident at actual conventions themselves. So here I am, feeling connected at some level with the original creator. But they have an existing circle of friends that I am not a member of. That circle of friends will have their own dynamic, often with the creator at the center, but still a personality unique to the group and distinct from the creator him/herself. My problem (well, one of them...) is that I have trouble fitting into community settings like that. Especially in larger, well-established ones. I'm much more of the "really small, tight-knit, inner-circle group" type of guy. I don't seem to work in extended networks well at all. I don't know that I really have a point where I'm leading to with all this. 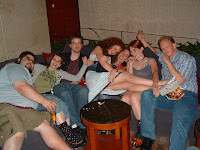 I find it interesting, and I've been thinking about it lately because of my nearly simultaneous "discovery" of Jennie Breeden (pictured above, second from the right) and The Dresden Dolls (not pictured at all and, in fact, have no relation to the comic industry). Talented folks who I could've become friends with, if I'd've known them before they had throngs of people clamoring to be their friends. Chalk this up as a "Sean's thinking about fandom even more esoterically than usual" type of post.